NGK Group Philosophy | About NGK | NGK INSULATORS, LTD.
At the NGK Group, we have passed down the company's founding spirit through the generations, guided by our corporate philosophy of creating new value through products that contribute to a better society. In 2019, the NGK Group celebrates its 100th year. We have taken a new look at the philosophical framework that has guided us up to now, and established the NGK Group Philosophy. Over the years, the NGK Group has provided new value to society with our unique technology, and contributed to improving quality of life, fostering the development of industry, and conserving the global environment. We will remain committed to meeting the demands of the age by continuously refining our technology and achieving new levels of innovation. We believe that this contributes to a better life for every person, now and in the future. We must constantly aim for quality improvement. Specifically, we believe that the three factors People, Product, and Management are vitally important. Businesses grow when people full of dignity and ambition gather together. Products embodying superior standards create value that stands above the rest. Management is built upon the sum total of the attitudes and conscience of each individual. 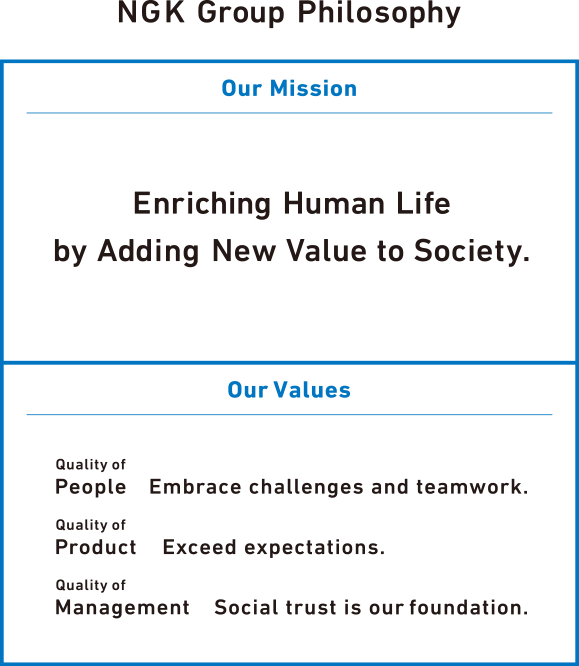 Our mission is only fulfilled by striving to ceaselessly refine these three factors of quality. The people who come together in the company are what supports each business activity. Every person aims high and diligently pursues challenges with a broad perspective and without fear of change. We encourage teamwork that transcends national boundaries based on mutual respect and bringing out the best in each other. We value such employees and support this motivation. We go beyond meeting specifications to look at the path ahead. We hone our own unique technology to create products that exceed customer expectations. Manufacturing, sales, engineering and all the divisions that support these areas work with dedication, partner with those outside the company, and constantly seek out new challenges. Our founder, Kazuchika Okura, left us these words: "We must work not only for the benefit of company profits , we must work to benefit the nation with a spirit of dedication." This is why our goal goes beyond the simple pursuit of profits. Our goal is to contribute to the well-being of people all over the world. Each one of us will strive with dedication and self-discipline as a member of our organization toward meeting the expectations of the international community. We believe such a sustained effort earns the trust of society, which is the foundation of everything.